Some cheeses are so hard that they must be broken apart rather than sliced. These cheeses are sold in a block, grated or shredded and are a flavorful addition to pasta, soup and salad. Hard cheeses require a partially skimmed milk for production and contain a high amount of protein. Parmesan, or Parmigiano, is one of the most popular cheeses consumed throughout the world. A cheese popular in Latin cuisine, cojita is called the Parmesan of Mexico. Aged Gouda from Holland has a nutty, sweet flavor. Parmesan is named for a city in Italy called Parma, but is enjoyed worldwide according to cheese.com. This hard cheese is dry and light-yellow with a golden rind on the exterior. With its grainy texture, Parmesan is a sharp-flavored cheese and typically grated onto dishes, such as pasta, salad or bread, in small amounts. After Parmesan is formed from milk curds in a two-day production, it is placed in a salt brine for one month. The cheese then matures for two years in a high humidity environment. Parmesan pairs well with Pinot Noir and Cabernet Sauvignon wines. Cojita is a hard cheese that comes from Mexico. Original cojita is made using goat's milk, but the cheese is also prepared with cow's milk. The strong flavor of cojita goes a long way, and the cheese is usually grated. The Parmesan of Mexico, cojita is served as a topping for refried beans, chili dishes and salads. Some Mexican dishes call for cojita to be added before cooking, such as in casseroles. 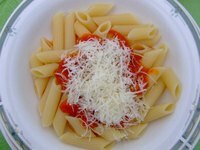 In the United States, cojita is served shredded in fruit salads and on top pastas and spicy dishes in place of Parmesan for more zip and flavor. Aged Gouda is a hard cheese that originated from the town of Gouda in Holland. When young, this yellow cheese is smooth and creamy, with fruity undertones and a sweet bite. Encapsulated in a waxy rind that is also yellow, the flavor of Gouda intensifies as it ages. Look for a black waxy rind to signify that the Gouda is a mature variety of the cheese and has been aged for more than 18 months resulting in a more intense flavor. Gouda is complimentary to wine and fruit, according to cheese.com, and is versatile enough to serve alone or use in preparing dishes.